Some people enjoy making grand gestures and use over the time ways to really express their feelings and thoughts. To others it can be challenging to really go all out in this way, since it just does not feel natural for them. 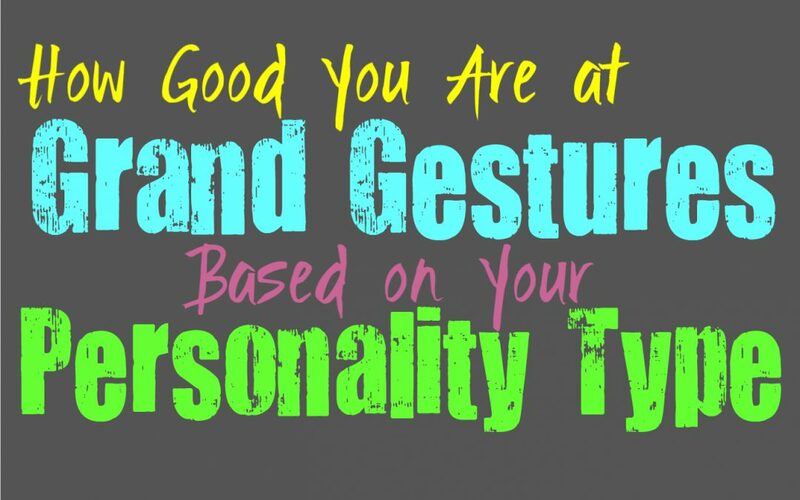 Here is how good you are at making grand gestures, based on your personality type. INFJs are sometimes good at grand gestures when it comes to certain people who inspire passion inside of them. In most situations INFJs can keep things to themselves and might not appear to be the most grand and expressive people. They do have a side of them which can be both a hopeless romantic and even a deeply expressive person. They possess so much depth and imagination, that they do often enjoy going above and beyond for someone who inspires this in them. For the INFJ it simply depends on the person and if they feel comfortable showing this side of themselves. ENFJs can definitely be good at making grand gestures, since they are outgoing and strong people. They aren’t afraid of being over the top in order to really make their presence or their intentions known towards someone. ENFJs also care deeply about making others happy and they are aware that for some a grand gesture can really make them feel good. If the ENFJ is trying to get in the good graces of someone special, they will be willing to go over the top in order to obtain this. They aren’t afraid of taking action and are often very forward people. While INFPs are introverts who enjoy keeping to themselves most of the time, they definitely have other aspects of their personality which not everyone gets to witness. They are often hopeless romantics who want to have a passionate and fulfilling connection with someone. They enjoy grand gestures as long as they are completely sincere and express their feelings in a way they can be proud of. INFPs aren’t afraid of making a fool of themselves for love, and that is a big reason why grand gestures can be truly appealing to them. ENFPs are definitely good at grand gestures, especially of the more romantic nature. When the ENFP really wants to win someone over they are often amazing at finding ways to express themselves. ENFPs know how to woo someone in a dramatic manner, which often makes this person feel deeply special and loved. For the ENFP sometimes a grand gesture is the only way to really express their inner feelings, since they are such passionate and imaginative people. Grand gestures aren’t normally something the INTJ is comfortable with, since it feels a bit unnecessary for them. They would rather utilize their minds as a way to debate or argue their stance instead of expressing it an over the top manner. INTJs definitely aren’t ones for grand romantic gestures, since this type of emotional expression feels overwhelming and far too vulnerable. INTJs would rather maintain control of their emotions and doing anything in a grand way often appear a bit out of control and chaotic. ENTJs are actually very capable of grand gestures, they might even enjoy expressing things in a more over the top manner. ENTJs like to gain people’s attention in the right way, and don’t like being ignored. When they want something to be known or expressed, they aren’t afraid of making truly grand gestures. ENTJs are outgoing people who have a strong presence around others, and these larger than life personalities which cannot be missed. Because of this they do often feel comfortable with grand gestures, even in a romantic sense from time to time. Grand gestures aren’t often within the style of the INTP, at least not in an obvious manner. There are many INTPs who have romantic hearts, they just have a hard time actually expressing this in an open manner. Over time they might develop a more romantic side and find ways of truly making this known to someone they care for. At the same time their gestures are often more subtle and sweet than they are grand and over the top. INTPs simply fear being vulnerable in this way, even though inside of their minds they might be capable of imagining truly grand expressions. ENTPs are often capable of truly grand gestures, whether that be romantic or otherwise. They aren’t afraid of taking a few risks and expressing things in a manner which appears a bit over the top. ENTPs are good at making their presence known and on top of that they are truly creative people. Their sense of creativity and outgoing personalities definitely make them good at grand gestures which other people might be caught completely off guard by. Being able to make grand gestures definitely requires creativity and a unique mind, and ENTP possess these qualities in abundance. ISTJs aren’t necessarily fans of grand gestures, since they feel unnecessary and a bit dramatic. They are much more practical in the way they express things, especially in a romantic sense. ISTJs just don’t like having to be over the top, this often feels like an attention grab for them. They would much rather find more reasonable and logical ways to make their point known. Being this type of dramatic and expressive person just isn’t the way the ISTJ behaves, since they are more internal and sometimes reserved on the outside. ESTJs are pretty good at grand gestures, as long as it being done in order to get something they want. ESTJs will go after what matters to them with a sense of focus and even intensity. They aren’t afraid of pushing themselves in order to accomplish their goals and obtain the things they want in life. For the ESTJ sometimes a grand gesture is the best way to win someone over or get noticed for the right promotion or position. They aren’t afraid of seeming a bit foolish, as long as they know it will get them to where they want to be. ISFJs aren’t usually seen making grand gestures, since they can appear more reserved. This is simply because ISTJs focus on being practical and getting things done the right way. For them doing anything too over the top can feel like they are trying to grab the attention of others. ISFJs will go out of their way to make their loved ones happy though, it is simply something they do in more practical ways and less dramatic expressions. If they feel like someone they love really does need a grand gesture, the ISFJ will do their best to make this happen. ESFJs are actually good at grand gestures in some situations, especially if it is what their loved ones need. They want to make others happy and they aren’t afraid of going above and beyond in order to do this. If the ESFJ knows that a grand gesture is going to make someone happy, they won’t be afraid of being a bit foolish in order to accomplish this. They do sometimes become nervous of being too vulnerable, but at the same time they are capable of a lot for the sake of others. ISTPs aren’t really comfortable with grand gestures or over the top ways of expressing themselves, but that doesn’t mean they aren’t capable of it. If the ISTP does feel passionate about something and wants to express this in a way which seems a bit over the top, they can often find great ways of doing this. Deep down they do have a flair for dramatics, they just prefer to be logical people with how they express things to others. ESTPs are definitely capable of grand gestures when they want to express something or make their presence known. They enjoy the attention most of the time and like being someone that others are a bit shocked by. When the ESTP is passionate or excited about something they aren’t afraid of showing this in more theatrical ways. ESTPs actually do have a flair for the dramatics, mostly because they enjoy seeking out excitement and intensity in their lives. While ISFPs might have a dramatic side and deep inner emotions, they aren’t always comfortable with grand gestures. For them it can feel a bit uncomfortable to express themselves in this manner, at least around most people. The ISFP might come up with these creative ideas in their minds, and desire the strength to really take part in these grand gestures. They often need someone they feel truly comfortable with to help them really come out of their shell. ESFPs are passionate people who aren’t afraid of being over the top or expressive when they are excited about something. They enjoy seeking out adventure and joy, and sometimes this means making over the top or grand gestures. If there is something the ESFP wants to draw attention to, they are capable of coming up with creative ways to do this. Their creativity helps them gain inspiration and gives them new ways to really express themselves in grand gestures.